I’m sure it comes as no surprise that we’ve been snowed in 2 days in a row….and we are going a little crazy. I had wanted to make red velvet pancakes, but I didn’t have the stuff, so I had to just make regular pancakes. My little Valentine’s loved them…..and it was a great start to another snow day! 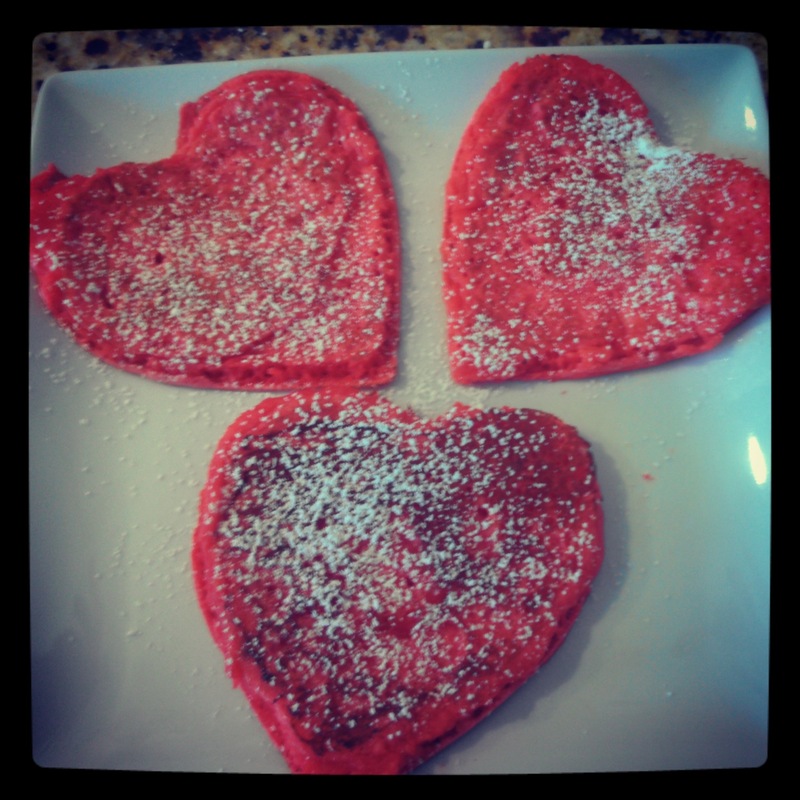 I didn’t have any pancake mix so I made my own, dyed it red and made them heart shaped. Voila! Valentine’s Day breakfast! Very simple, using ingredients most people have on hand and yummy (I don’t really eat pancakes, but my girls enjoyed them). Whisk ingredients in a large bowl. Pour mix into a heart shaped cookie cutter. Once pancake starts to bubble a decent amount, remove cookie cutter and flip pancake. Cook for another minute or two until the other side is a cooked thru….and gets a little brown. Syrup, powdered sugar, whipped cream, fresh fruit…. In honor of New Jersey (YES…..It’s being played in New Jersey, NOT New York) hosting the Super Bowl tomorrow, I decided to post a recipe that’s popular here. And just because everyone’s asking and talking about it……This Jersey Girl and JETS fan will be sporting my Seahawks shirt (#25)!!! Go Seahawks!!! This is a great thing to make after a night of drinking…so maybe Monday morning after the big game! Here in NJ we have one of the most delicious things you’ll ever lay your mouth on. 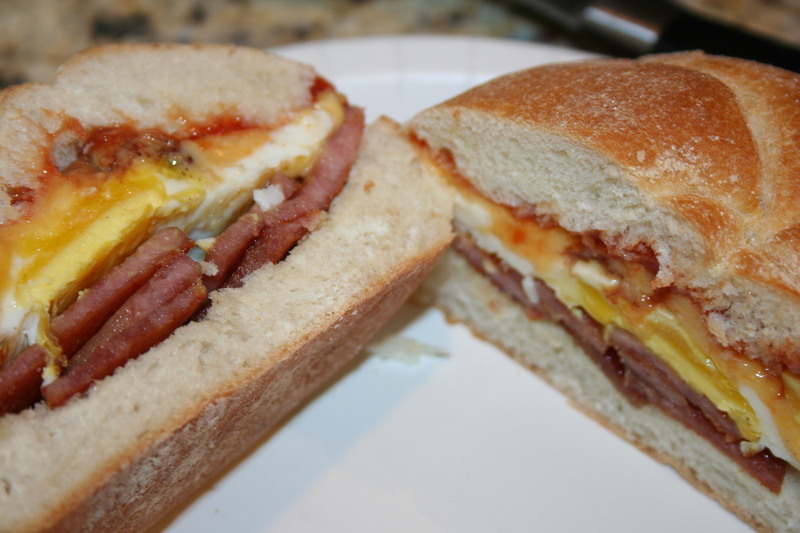 In North Jersey we call it taylor ham, egg and cheese in South Jersey they call it pork roll, egg and cheese. It’s also popularly known as “TEC” because this is what is written on the wrapper after it’s wrapped up to go with your coffee, iced tea, 1/2 & 1/2 (known around the world as an Arnold Palmer, but in my parts a 1/2 & 1/2). You can’t even get taylor ham/pork roll in many parts of the USA….shocking that some people have never had the pleasure of enjoying this NJ delicacy. So what IS taylor ham and pork roll, you ask???? Well Taylor Ham is actually a brand of pork roll…..just like Q-Tip is a brand of cotton swab or Band-Aid is a brand of adhesive bandage. 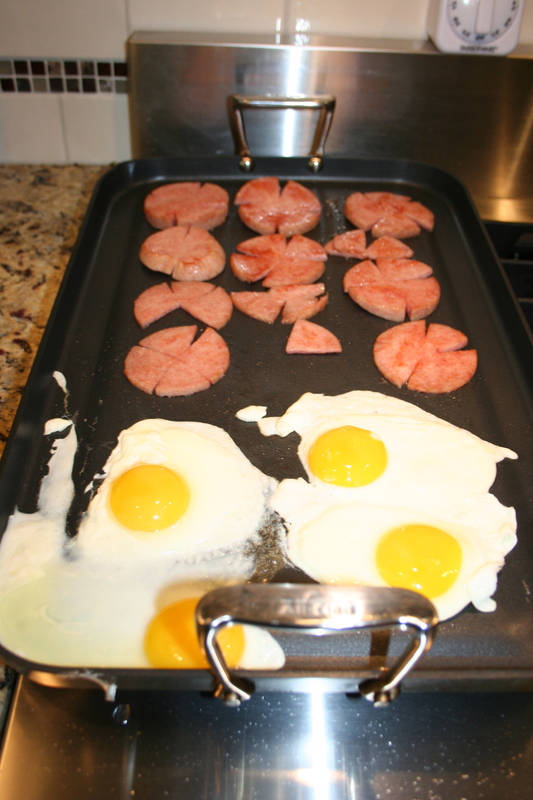 Pork roll is a breakfast meat…similar to ham, but when pan-fried in a skillet or on a griddle, tastes much different. It gets sliced (sometimes it comes sliced already) into a circle and then gets 3 or 4 slits around the circle…to prevent the finished product from curling around the edges. Once cut up, you put the pieces onto a hot, buttered griddle or frying pan and cook it for about 5 minutes on each side…or until it’s browned. On the other side of the pan or griddle crack open your eggs….right on the hot pan! Cook the eggs however you like them cooked….they are usually served fully fried or over medium (yolk harder), BUT some like it a over-easy and more runny. You can cook it however you’d like. Once it’s almost cooked to your liking you add the American cheese and let it cook until it’s melted on top of the eggs! Next you simply layer it all on top of a hard roll, a bagel, a croissant..I prefer mine on a hard roll and add some salt, pepper and ketchup (SPK). When you order one of these sandwiches in NJ…..they will always ask “saltpepperketchup?” 3 words, mumbled into 1, but that any New Jerseyian understands. I eat mine with just ketchup…no salt or pepper! So that’d be “TEC K” in Jersey terms! I’d say most people get “TEC SPK”. Make sense??? And voila……THE MOST AMAZING THING EVER! Recently I had to make a large amount of bacon for a class breakfast in Olivia’s class. The thought of standing in front of my stove frying 4 pounds of bacon was something I knew I didn’t want to do, especially because it needed to be at the school by 9am and frying that much bacon could take hours…and let’s not forget how much grease I’d probably get splattered all over myself and my kitchen. NO THANK YOU! So my best friend Nil told me about cooking it in the oven. She said I would never cook it on the stove again…..
“it’s perfect bacon”, she said. “And without any mess!””, she said!!! I figured it would be very hard to mess up bacon….and if it was making my life easier, why not give it a shot? Plus, I usually trust her ways around the kitchen. She was right! Since I’ve done this for Olivia’s class I’ve made bacon a few other times (obviously)…and every time it’s been done in the oven. And it really is delicious, perfectly cooked bacon….without any mess! Bacon is a favorite of mine (ours)…we eat it for breakfast, I make a lot of recipes with bacon, put it on salad, on sandwiches…….but the mess that comes with it– all over myself and my stainless steel and black stovetop, was never fun to clean up. Thanks, Nil!!! Lay COLD bacon on cookie sheet leaving just a tiny bit of room between each piece. Put sheet into a COLD oven (this is important from what she told me). Turn oven on 400° F and cook for 20 minutes. Once it’s done, remove bacon and lay on paper towels to absorb the grease. As you can see you will have perfectly, evenly crispy, delicious bacon! No mess either…once the grease is cooled down just gently pull the foil up and throw it in the garbage! No need for a grease can or anything!